Hayes has written creative, fresh settings of familiar carols that sound hard but are easily played by intermediate and advanced players alike. Special attention is given to smaller-handed pianists...no excessive use of octaves, no large leaps or chords, and thinner but satisfying harmonic textures. However, the trademark Hayes harmonies, modulations and embellishments are still there. Each arrangement is three minutes or shorter, making them perfect for use in services where timing is a consideration. I only am familiar with about 1/2 of the songs but I really like the arrangements for those I know. Disappointed that there weren't more familiar tunes included. 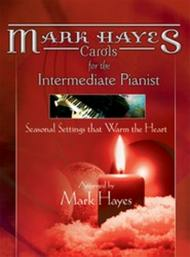 Beautiful arrangements with all the luscious harmonies expected from the music of Mark Hayes!